“I have had the opportunity to spend time in Maine and on the Maine islands in Penobscot Bay, since 2002. The islands have had a major influence on my art. 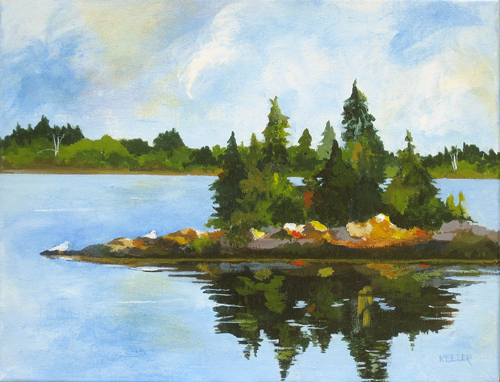 As an artist one always sees coastal Maine and the islands as a series of potential paintings--endless combinations of sea, sky, tide, and spruce trees. The peace and naturalness, the presence of little commercialization, the strong desire to preserve this for the next generation--all of this speaks to my art. I love to paint the beautiful Maine coast but the thought is always present that this landscape and lifestyle here and at home, are threatened in today’s world." Starting with works on paper--drawing and watercolor, Ms. Keller became a full time artist in 2001 and selected acrylics as her medium. Major influences on her style come from two excellent teachers: workshops with Maris Platais for landscape and marine paintings, and with Heidi Whitman at Mass Art for contemporary styles and materials. Ms. Keller is an artist member of the Cambridge, and Concord (MA) Art Associations. She has exhibited her art in over 80 groups shows in Massachusetts and Maine. Her most recent solo shows were as the feature artist at the Barb Jackson Gallery in Rockport, Maine, the North Haven Gallery on North Haven Island, Maine, and the Harvey Wheeler Community Center, Concord, MA. Nationally, she has exhibited in juried shows of the Cambridge Art Association, Brush Gallery (Lowell, MA), Concord Art Association, Cooperstown (NY) Art Association, Taos (NM) National Society of Watercolorists, and the New England Watercolor Society Biennial.